I would love to say that I had a restful weekend and was just able to lounge around the pool, sipping on a coke and enjoying the nice weather. Unfortunately I wasn’t able to lounge around and we don’t have a pool! I was a little concerned about something that was going to happen on Sunday. I knew in my heart that everything would go well, but there were just so many things that needed to be done. Yet everyone did such a wonderful job and things went well. Let me back up just a little. It is 1959 and a couple joined Highland Baptist. They had two little girls at the time. It wasn’t long until the woman began helping out in the services by playing the piano and singing. She would sing in a group or by herself. Either way she did a great job. Not long after another girl was born. As the years went by there was no doubt that she would be at the piano each time the service started at Highland. Her ability on the piano just drew people into a spirit of worship. She worked diligently to make sure that the music she played was just right. Let’s move forward to 1994. There was a new pastor at Highland and he felt so blessed that this woman was on the piano. Each song service seemed to lift up the name of Jesus. There was a joyful sound coming from the worship center as the service began. This same woman was using the talent God had given her to draw people into the worship experience. Now we come to the present. This woman still has the desire to be at the piano, playing to the glory of God, blessing hearts and just enjoying doing what God has enabled her to do. Recently she has had some health issues that caused her to have even more problems with her eyes, but she is still working to overcome them. She has blessed so many over the years there is no way to even imagine. So because we have so much love and admiration for her, this past Sunday we had what we called ‘Ann Winegeart Day.’ Ann and Bro. Gene have been so faithful to be a part of the church over the years. It was a surprise so we had to hide things from her and Bro. Gene. All three of their daughters and son-in-laws some of the grandchildren and great grandchildren came into the service after the announcement was made about what was going on. Her daughters and three of the grandchildren sang “Are You Washed in the Blood/I’ll Fly Away”. Maybe I should tell you that it was a great experience and I know that some tears were shed. Ann Winegeart has touched the hearts of many people with her singing and playing the piano. We had the opportunity to tell her thanks and took it. I just want to say that many others, like Ann, are doing what God would have them do. 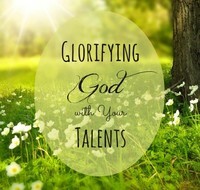 They are using the talents, the gifts, He has given them to minister to and reach out to those who are lost and in need. Paul said in Romans 12:6-8 -- 6 Since we have gifts that differ according to the grace given to us, each of us is to exercise them accordingly: if prophecy, according to the proportion of his faith; 7 if service, in his serving; or he who teaches, in his teaching; 8 or he who exhorts, in his exhortation; he who gives, with liberality; he who leads, with diligence; he who shows mercy, with cheerfulness. Paul didn’t put in the gift of singing or playing the piano, but surely it fits in the area of serving. The question is – “What gift do you have and what are you doing with it?” Whatever it is, use it to reach out to those around you for JESUS! Again, I want to say ‘Thank you’ to Ann for sharing her wonderful gift. JESUS, JESUS, JESUS, there IS something about that name!